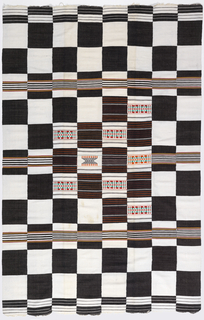 See more objects with the tag stripes, trade, checkerboard, cross-cultural, indigo, African, Dyula. 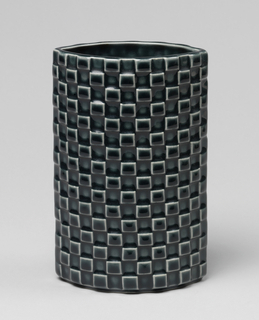 See more objects with the color black dimgrey darkslategrey saddlebrown or see all the colors for this object. This is a Wrapper. It is dated mid-20th century and we acquired it in 1979. 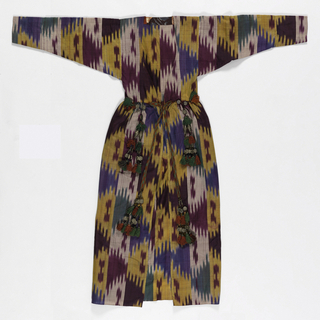 Its medium is cotton, rayon and its technique is hand-loomed warp-faced plain weave with discontinuous supplementary weft patterning, tied-resist patterning in warp (ikat), indigo-dyed. It is a part of the Textiles department. 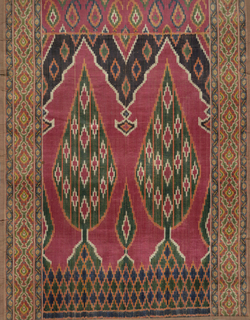 The dynamic checkerboard effect of this wrapper was created using the ikat technique. Before weaving, the warp yarns are tie-dyed in two contrasting stripe patterns—one predominantly blue and the other predominantly white. The dyed yarns are then woven in a continuous narrow strip and further embellished with scattered, brightly colored, brocaded motifs. The strip is cut and the pieces sewn side-to-side, carefully aligning the pattern areas to create a checkerboard design. 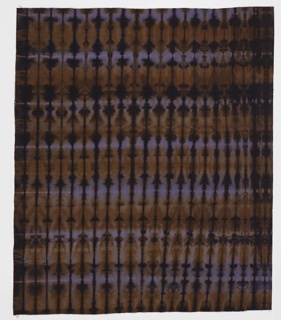 The transition between the blue and white squares has the blurred effect characteristic of the ikat technique. This type of cloth has become associated with the Baule people. 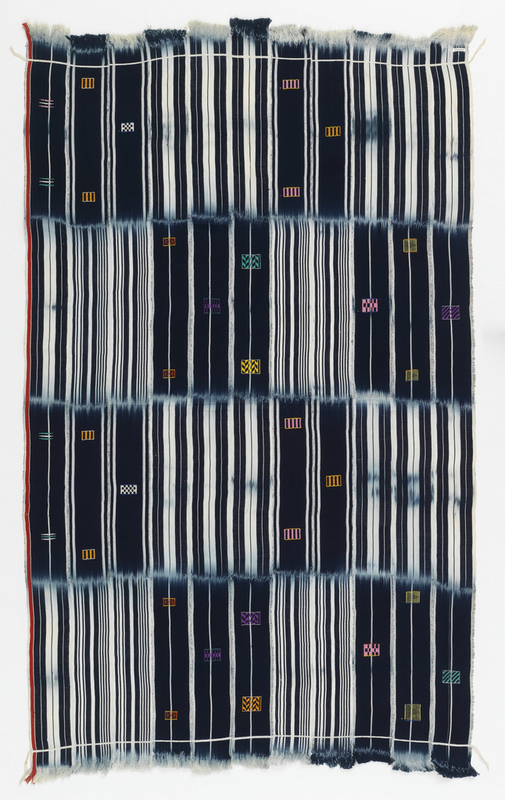 The complex ikat technique, however, is rarely used in Africa and was undoubtedly brought to the Baule by Dyula dyers, who had major trade routes throughout the region; many Dyula migrated to Ivory Coast during the 1950s and 60s. The single red border is also characteristic of Dyula weavers. Christine Giuntini, Conservator in the Department of the Arts of Africa, Oceania, and the Americas, The Metropolitan Museum of Art; email message to author, November 24, 2014, regarding the unpublished research of Jerry Vogel. This object was purchased from Craft Caravan, Inc. and fund: Textile Department Fund and catalogued by Milton Sonday. It is credited Museum purchase from Textile Department Fund.